A cover is very important when it comes to a sand box. Usually a sandbox is kept outdoors in the backyard and so, a cover is crucial if you want to keep the sand box clean. If there are cats in your neighborhood, you will even face the danger of a cat using your sandbox as its toilet! Keeping the sandbox clean is very important since your children would be playing in it and it is important to give them a hygienic place to play. Of course, it is not feasible to change the sand every day and so, a cover is the most important thing a sand box should have. However, usually sandbox covers are very light weight and they don’t cover the box completely. Make sure the cover that comes with the sand box is of good quality and is not just a small mesh cover. If you don’t like the cover originally provided with the sandbox, you can even order a new cover off from Amazon or EBay or make your own cover. Making a cover is not difficult and you only need to find a good quality cloth and cut it in the shape and size of the sand box and then install hooks or knots to fix the cover to the sand box when it is not in use. There are also covers that come in the form of lids. These are the best to use since they are heavier and have a locking mechanism that can’t easily be moved easily by pet animals. Also the lids cover the sand box completely keeping it clean and free of debris. This sandbox with cover in the form of lid is in the shape and design of sandstone. The sandbox comes with convenient seating for the children and is fully assembled. This covered sandbox has a very modern style and design that attracts the children and looks good aesthetically. It comes with molded seats to be comfortable for the children. This crab shaped sandbox with covet is sure to attract your children and delight them. it has molded seats and a lid made of the same red plastic. The lid is in the shape and design of the shell of the crab. This lid-covered sandbox has an elevated design that is perfect for toddlers. The lid has tie downs to firmly keep the lid in place and keep the sandbox clean. 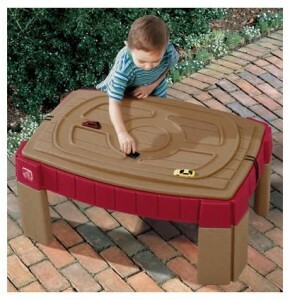 The lid also has molded in roadways for little children to play on the lid even. 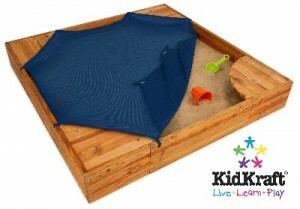 This 2 in 1 sandbox with cover is perfect to keep the children busy and playing for many hours at an end. The water center provides unlimited activities in the water and the sandbox helps the child build his imagination by letting him play with his sand toys and build castles.